Families gathered round the dinner table is a wonderful thing to me. Gathering around the table for a traditional Sunday dinner is even more special. We set aside Sunday as a time of rest, reflection, and praise. Why not take that one step further and add the tradition of the Sunday dinner. Instead of using your regular plates, why not bring out your special china if you have some? Light some candles, add a beautiful floral or seasonal centerpiece, put on some soothing, relaxing soft music in the background and sit down with your family and share a special meal. What are we waiting for? Why let your pretty china sit on the shelf only to collect dust? Instead of waiting for the perfect time, the perfect company, etc. use it now! Aren't are families deserving of the "best?" It takes very little expense to set a lovely table. 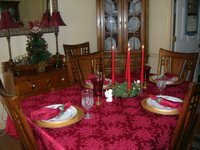 I wanted to show you a picture of our Sunday dinner table to show that you can make it "special" for your family on a budget. The candles came from the dollar store, I got the tablecloth and napkins for 75% off at the after- Christmas sales and I got the pretty goblets from Arbys, of all places, for 99 cents apiece! If you look around long enough you CAN find some wonderful things to set a beautiful table with VERY affordably. The dollar stores are wonderful places to not only find the candles that you will need but also the materials to make beautiful centerpieces. How about going to the grocery store and picking up one of the bouquets for $2.99, or better yet, go out in your own backyard and start cutting your own flowers. Let your children get involved in setting the table and let them share in the excitement of the preparation for that special meal. Tasty, wholesome food DOES NOT have to cost a fortune. Plan your meals in advance, cook more from scratch, and clip coupons. It can be done, I promise. Isn't it so worth it to be able to provide your family with the wonderful experience of sitting down together for a meal? And I'm not just talking about Sunday, this can be done other nights of the weeks as well. You will be so happy you did and your husband and children will be too! What are you waiting for?? How about THIS Sunday?? Susan, I loved this post. We think so alike! I really do not care to eat out. It is so expensive and the food can be good but one dinner out can go a long way on the weekly grocery cost. But...if others enjoy eating out I understand that, it just isn't for me. I also am a great believer in using our pretty and special things now, with our families. Who is more special? So many good moms and grandmothers kept things and never used them and then they are sold at estate sales and auctions. I want to use my special and pretty things. This was a very thoughtful post. Have a wonderful weekend! You are so right~it's very disappointing to spend all that money at a restaurant and not enjoy your meal. I have been trying lately to make at-home meal time more special, as it's getting harder to keep my busy teenagers home for dinner. Thanks for the great ideas. Isn't it amazing how you can purchase such beautiful things at great prices sometimes? I am often surprised at what I can even get at Goodwill. However, I had to get a giggle over the glasses from Arby's. They are beautiful! Your table looks lovely and I totally agree with your "making dinners special for just family" concept! After all, who is more important than one's own family! Beautiful post!!! I am in complete agreement with you about eating out. Too many times we end up having to talk very loudly to be heard, too. And yes, the meals are always overpriced. Homecooked meals with family and friends is always so much fun and so very enjoyable! !